An elusive sub-two hour marathon will finally be run in 2032, but women are unlikely to ever breach the magical mark, according to modelling released by scientists Wednesday. The 42.195-kilometer race was one of the original Olympic events in 1896, and runners have been edging closer to the hallowed 120 minutes ever since. But a new statistical model based on male and female marathon world record progressions suggest there is still some time to go before anyone achieves the feat. Research, led by Simon Angus from Melbourne's Monash University and published in the American College of Sports Medicine's flagship journal, forecasts the first sub-two hour marathon will likely be run by a man in May 2032. 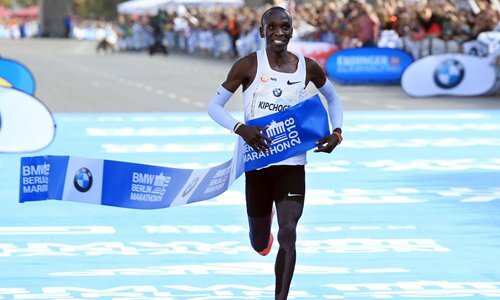 Kenya's Eliud Kipchoge holds the current IAAF (International Association of Athletics Federations) men's record - 2:01.39 - set in September last year at Berlin. The world governing body recognizes two marks for women - Briton Paula Radcliffe's 2:15.25 from 2003 in London, where male and females competed, and the 2:17:01 by Kenya's Mary Keitany in 2017 at a London race for women only. According to Monash Business School, their study is the first to address all three related aspects of marathon performance in one modelling framework - sub-two hours, the limits of human physiological running capacity and gender equivalence. Angus said they were able to reconceptualize the "sub-two hour question" as one of odds - for example, when will a given time be run with a 10 percent likelihood. It claimed the economic model was, on average, accurate to within one percent for men - or around 70 seconds - across the 66-year study period which saw 19 minutes shaved off the world mark. For women, accuracy was within 3 percent - or roughly 200 seconds - across the same period where the world record dropped by one hour and 22 minutes. "In other words, if an IAAF marathon were run in May 2032, then I would predict that there is a 10 percent chance that a runner in that event will break the two-hour mark," said Angus, an economics professor and ultramarathon runner. "By inspecting the prediction lines on my economic model, there was only a 2 percent chance that the sub-two hour record would be broken at that point in time," he added, ­referring to Kipchoge's recent record run. Angus added that while a sub-two hour run could occur any time between now and May 2032 "the likelihood [according to the modelling] of that occurring is extremely rare."